Sterling Bank Plc is becoming synonymous with the keeping of its immediate environment clean which has earned it the sobriquet of “Clean Environment Bank”. The bank in Abia State for over the years has not only been talking about keeping the environment clean, but has been working the talking. Periodically, the members of staff of the bank would leave the comforts of their offices to areas perceived as the dirtiest parts of the two major cities in the state- Umuahia and Aba – and work to the admiration of the residents. The bank has in this regard previously paid much attention to Aba because of what its officials say was the peculiar nature of the city. But as it was drawing the curtain for this year’s exercise, the bank shifted base to Umuahia and precisely to Isi-Gate as it went for the last clean up exercise for the year. Speaking after the exercise, which lasted from 7:00 a.m to 9:00 a.m, with all the bank staffers in the state in attendance, Ubong Isong, regional business executive, South-East 1 of the bank, disclosed that Sterling was partnering with the state government through the Abia State Environmental Protection Agency (ASEPA) to keep the state clean under its Sterling Environmental Makeover (STEM). He said that by doing that, the bank creates awareness for the people to keep their environments clean. Isong, son of a former Central Bank of Nigeria (CBN) governor, the late Dr Clement Isong, revealed that apart from keeping the environment clean and equally creating awareness for people to do the same, stated that through the programme, Sterling Bank has helped small and medium industries in Aba and Abia State as a whole to grow by buying all the kits and equipment used in the exercise from local manufacturers. “The environmental kits we give out during the sanitation exercise were hitherto imported, but we now buy them locally from manufacturers in Aba and even distribute to other states,” he said, adding that it was a way of encouraging local manufacturers. On the impact of the exercise, which the bank that has been in operation in the state for the past 10 years, had carried out periodically over the years, Isong said: “We’ve taken stock about the impact of the exercise and this has given us the urge to continue. In fact, when we decided to come to Umuahia this time around, the people of Aba were crying, asking us why we were moving it because they so much enjoyed what we did when we were there last time. But we will touch everywhere in the state to create the awareness so that people will see the need to keep their environment clean all over the state and that is why we are in Isi-Gate (Umuahia) this time around and we will be alternating it”. The regional business executive of the bank said it was not only through environmental exercise that Sterling Bank gives bank to society. His words: “We do not give back to society through the environmental exercise alone, there are several other things we do. But this one is special to us; we keep this one very close to our hearts, so we are very dedicated in this. For instance, we donated incubators to some hospitals; we are involved in so many other things all over the country. But this one, Sterling Environmental Makeover (STEM) is very dare to us and we do it in 15 locations simultaneously across the country”. The Manager of the bank in Abia, Damian Onyebara, said that the spectacular thing about this quarter’s exercise was that it was the first time of bringing it to Umuahia, having concentrated in Aba all these while. “And, of course, again this one is unique because the Speaker of the state House of Assembly is here and the corps members are also involved,” he pointed out. The Speaker of the Abia State House of Assembly, Rt. Hon Martins Azubuike, who took part in the exercise commended Sterling Bank for introducing the STEM programme which not only made the members of staff of the bank leave their cosy offices to embark on not only cleaning up the environment, but also to create awareness for people to keep their surroundings clean. “This is a wonderful programme in the sense that the bank may have been doing other things to give back to the society, but none I’m such will make the impact STEM will on peoples’ life,” he said. He called on other corporate bodies to emulate Sterling Bank and join in keeping the environment clean for the benefit of the people. ASEPA through its spokesman said it has been encouraging Sterling Bank in the exercise by providing manpower and materials to assist them whenever they are embarking on the exercise. He advised those using the area where the exercise took place as market to always ensure they pack all their wastes and put in ASEPA receptacles to enable them evacuate them promptly. An ad hoc member of staff of ASEPA who simply gave her name as Nkechinyere urged the government to enact a law that would ensure that those who contravene the law on sanitation are adequately punished. 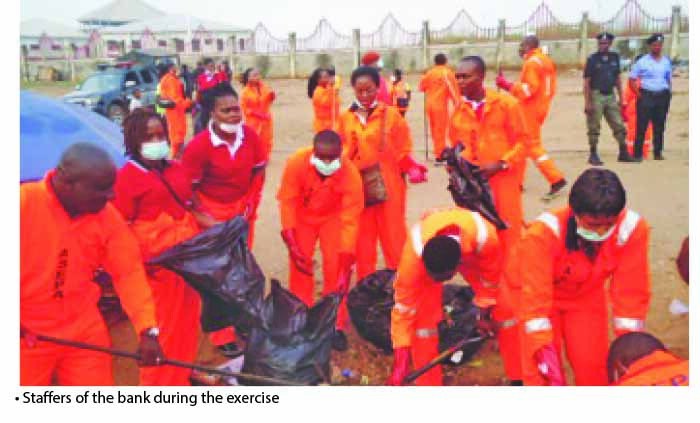 A youth corps member, Ayo Okwudili Mercy, who took part in the exercise said that they were elated when called upon to help Sterling Bank in the exercise, to sensitize the people on the need to keep their environment clean. “We see this as part of community work and we are delighted by what Sterling Bank is doing”, she said.